Tampa, Fl. 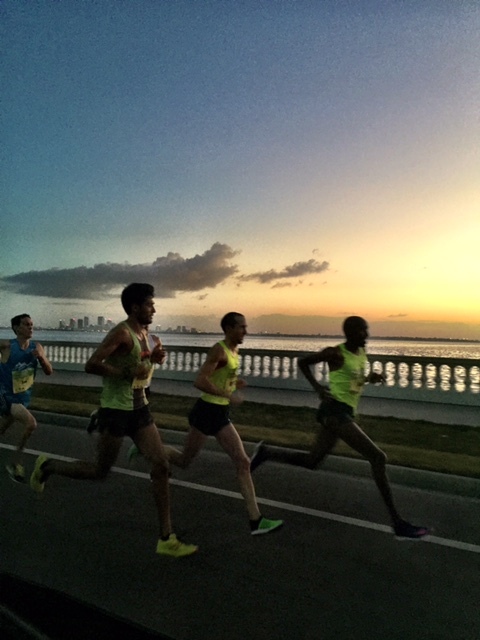 — Finishing under a warm butterscotch sun three-time U.S. Olympians Dathan Ritzenhein and Jen Rhines captured top honors today at the Publix Gasparilla Distance Classic Half Marathon. Dathan and Jen both broke year-old course records in the process, Ritz’s 1:03:17 erasing Ryan Vail’s 1:04:09 from 2014, while Rhines’ 1:12:35 white-outed Lindsey Scherf’s 1:13:08 from the books. They each won $8000 for their victories, as well. But how they won their titles, ah, that is where their stories diverge. The men lit out into the pre-dawn darkness at a modest pace under calm but humid 57 degree temps. A pack of seven soon formed as the course led over the bridge onto Davis Island for the first five miles. Four-time Olympian Abdi Abdirahman, just back from a six week training stint in Ethiopia, established the pace with Americans Ritz, Fernando Cabada, Ian Burrell, Brett Gotcher, Carlos Trujillo and 22 year-old Tampa resident Brian Atkinson all in easy contact. Mile two passed in a desultory 10:06, perfect from the Ritzenhein standpoint. Ritz is gearing up for his first run at the Boston Marathon on April 20, and only decided to run Gasparilla on Monday as record cold temperatures descended on his upper Midwest home in Rockford, Michigan. A 4:46 third mile (14:52) was followed by another 5:00 fourth mile (19:52), which did nothing to unsettle the pack, which was running alone through the dead still, empty streets on Davis Island. Only when the course came back over the bridge onto Bayshore Boulevard did last year’s fifth place finisher Fernando Cabada of Fresno, California throw in the day’s first acceleration. 29:29 at six miles is hardly a testing split for such talent, but it was enough to dispatch 22 year-old Brian Atkinson and Carlos Trujillo, leaving Cabada, Burrell, Gotcher, Ritz and Abdi cabled together. “I liked how it started out easy, but kept on getting faster throughout,” said Ritz as he stretched his hips in the VIP tent after the race. He came to Tampa off a busy racing schedule in early 2015 following a light racing 2014 as he dealt, once again, with a series of injuries, notably a sports hernia and a bad ankle. On January 6th Ritz won a 10K cross country race in Italy. Four four days later he took third at the Great Edinburgh Cross Country 4K in Scotland, before taking another third place at the USATF Cross Country Championships in Boulder, Colorado earlier this month. 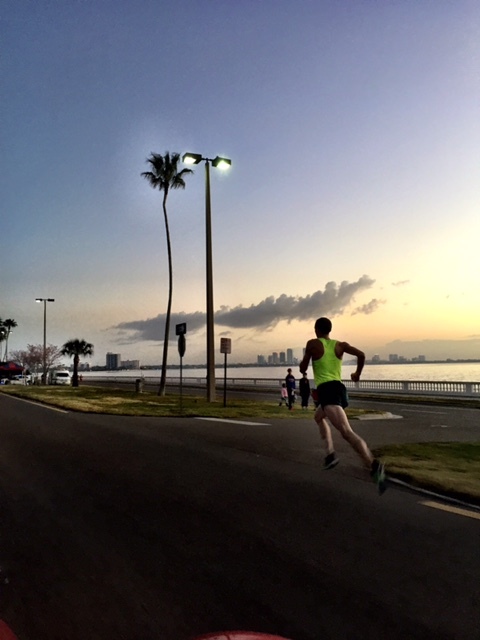 Eight miles of the Gasparilla half-marathon course pass alongside placid Tampa Bay on Bayshore Boulevard. As the five men sped south on the outbound leg toward the turnaround at nine miles, the first smears of the new day began to paint the sky to their left with the city skyline etched in the distance. At eight miles (39:08) Abdi Abdirahman threw in a quick surge after being momentarily dropped the mile before. That is not unusual for a first race of the season, especially after a long flight from Addis Ababa, Ethiopia to Tampa just two days before. At the turnaround Ritz took control. Colorado Springs’ Ian Burrell fell off, then between miles 9 and 10 Ritz eliminated Brett Gotcher, too, who came to Gasparilla after an eighth place at the U.S. Half Marathon Championships in Houston in January. Fernando Cabada found himself under pressure, as well, with only Abdi able to answer the call to action. They hit mile 10 in 48:38 and 48:40 respectively, with Ritz pressing smooth but steady. Abdi dug in trying to maintain contact, but in so doing left himself vulnerable to the lag that comes when an all-in effort comes up short. After Dathan had broken away from Abdi at ten miles I could hear one of the outbound runners shout out across the median strip along Bayshore Boulevard, “Ritz is back, baby!” Yep, that seems to be the case. From there Ritz spun out three more 4:40 paced miles and rolled to victory with Abdi, Gotcher and Cabada battling for the other two podium positions. All three finished inside 1:04 and just four seconds apart at the line. Abdi took second 38-seconds behind Dathan. Next up for Ritz and Abdi is the New York City Half on March 15th where they will meet, among others, 2014 Boston Marathon champion Meb Keflezighi. That will really show where things really stand before Boston on Patriot’s Day. 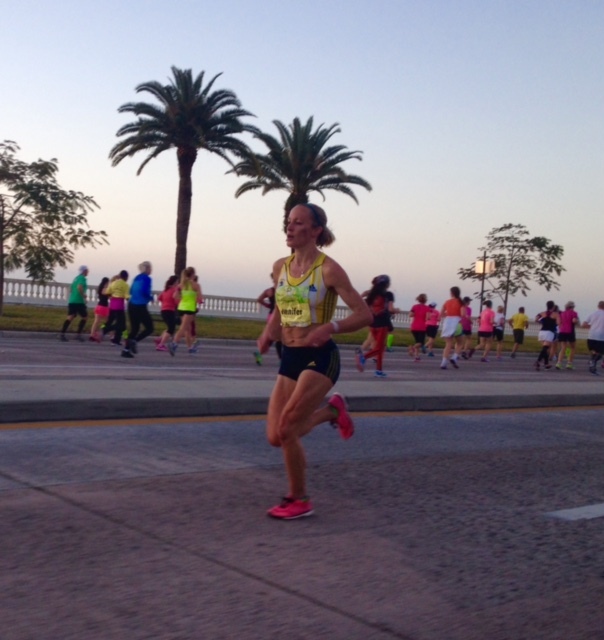 The women’s race was more a one-woman show as ageless 40 year-old Jen Rhines, now of Boston, held off a late charge from 24 year-old Neely Spence Gracey, daughter of 1990 Gasparilla 15K runner-up Steve Spence. At the half-way mark former Villanova NCAA champion Rhines had stretched out to 17-second advantage over 35 year-old Heather Lieberg who was coming in off the two best performances of her career, a second place finish at last fall’s Twin Cities Marathon, and a third place at this year’s Carlsbad Half Marathon in a PR 1:13:42. Gracey ran in fourth place at the half-way mark some 30-seconds behind, but finished strong to close to within seven seconds at the line and post a 10-minute PR, as she is still new to the longer distances. Montana’s Lieberg showed form for her upcoming marathon in Los Angeles, posting another PR in third at 1:13:09, while Clara Santucci finished in fourth in 1:14:10. “This is the longest race I’ll run all year,” Jen told me after the race. She finished third several weeks ago at the USATF Cross Country Championships in Boulder, then stayed in Mammoth Lakes, California for a couple weeks to avoid the snow and cold back home in Boston. Imagine going to ski country in California to avoid the winter in New England. It’s an odd old planet we’ve got here (or that we’ve made here). Gasparilla celebrated its 38th anniversary in 2015, but this was only the second year for the return of pro racing to Tampa’s premier road race weekend after prize money had been dropped after 1997. 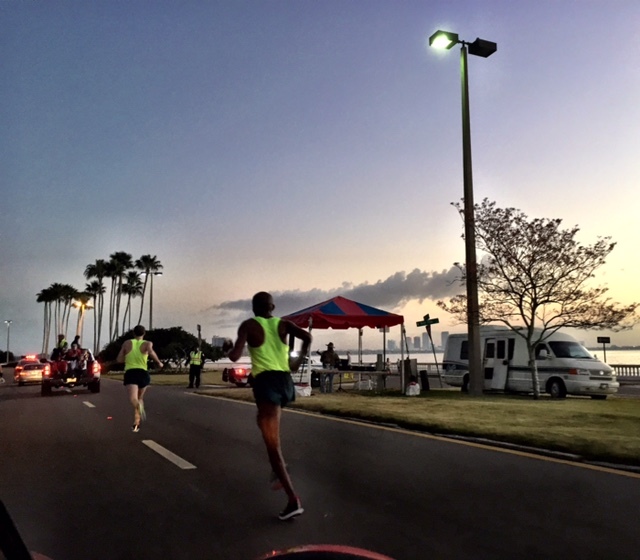 But when Ryan Hall came to Tampa in 2009 for a solo effort, long-time race director Susan Harmeling saw how much excitement and energy a top runner could bring. 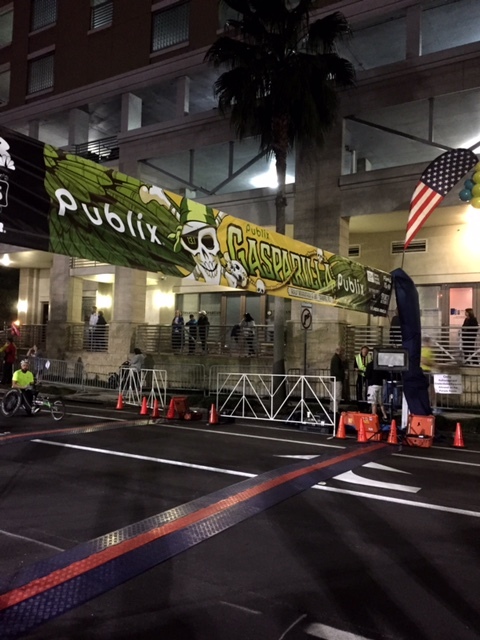 That had the Gasparilla board of directors rethinking its no-prize money policy, and with the invaluable assistance of their title sponsor Publix Super Markets the top end of the sport has returned with all the attendant attention it brings. 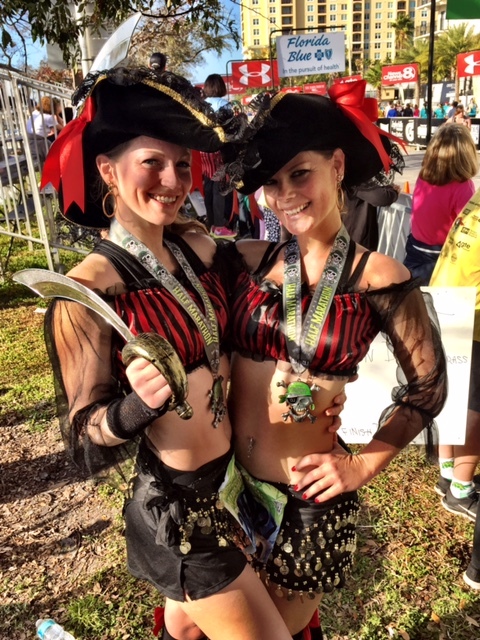 30,000 runners descended on Tampa for Gasparilla’s four-race weekend this year. The 15K and 5K on Saturday and the half-marathon and 8K on Sunday all sold out. A little something for everyone is running’s calling card in the 21st century. The best quality deer antler velvet extract has been taken by our lab and imported it. Definitely cool to see Gasparilla back in the game.